Documents load in 2-Pane View, with the document in the left-hand (LH) pane and comments in the right-hand (RH) pane. Paragraphs are automatically numbered along the LH pane&apos;s right margin. A “comment balloon” next to a paragraph number indicates how many comments that paragraph has (e.g. there are five comments on paragraph #6 in the screenshot above). Mousing over the document highlights the sentence you&apos;re on in blue and outlines the paragraph in gray. 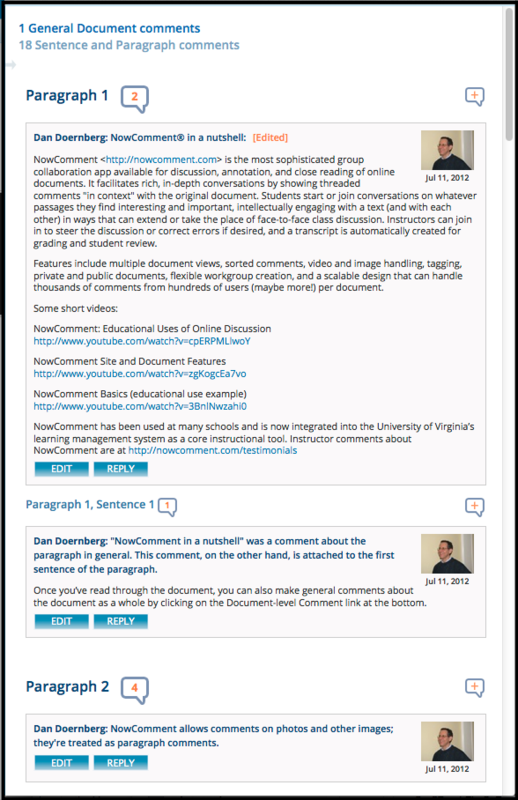 Document passages and comments about them are synced; single clicking a document passage scrolls the screen to highlight and show any related comments. 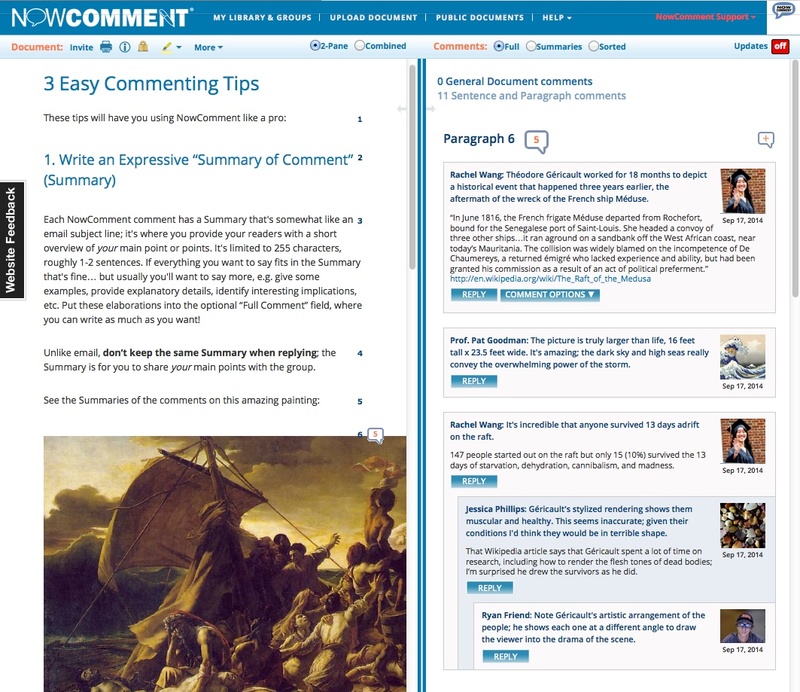 Similarly, clicking on a comment or comment header will scroll the document to highlight and show the corresponding passage. 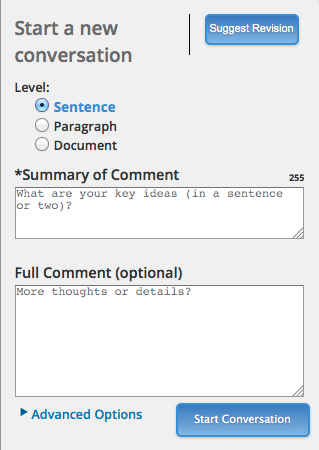 “Summary of Comment” —a required overview of your comment; the essential point(s) you want to make. One or two communicative sentences work best. “Full Comment” — optional; lets you flesh out your summary line with more detailed arguments and perspectives, citations, data, etc. Full vs. Summaries mode — When you first load a document, NowComment shows all the comments in Full mode (both the Summary and Full Comment fields). But if you don&apos;t want to read all the comments in full right away, choose “Summaries” to just see the Summary field for each comment; this lets you quickly skim what people are talking about. 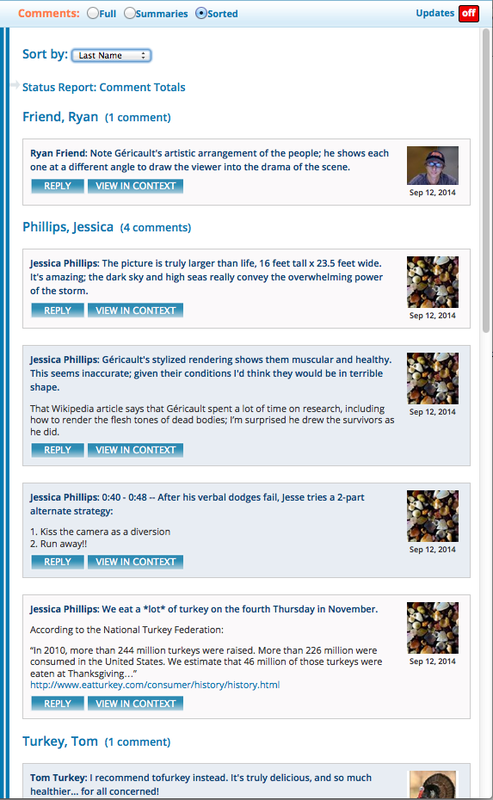 The screenshot above shows comments in Summaries mode. An “Edit” button will appear for each of your comments; you can edit a comment at any time until someone else replies to it; the comment will show that it&apos;s been edited. When you mouse over any part of a comment, a “Comment Options” button will appear; mousing over that button will pull down a menu with additional commenting features. Edit Comment — the Document Owner, and the Group Admin if that Document is shared with a Group, can edit a comment; the comment will show that it has been edited. Delete Comment — similarly, the Document Owner can delete a comment at any point. Show Comment URL — this option generates a link that takes people right to that comment and the corresponding part of the document. New Conversation — just an alternate way to start a new conversation (thread). Hide Full Comment — shows just the “Summary of Content” field for this comment. Hide Thread Detail — shows just the “Summary of Content” field for all comments below this one. All these options are available to you when the comment is yours even if you&apos;re not the Document Owner, but you can only edit or delete your comment if no one has replied to it yet. If you&apos;re neither the Document Owner nor the Commenter then you can&apos;t edit or delete it, but you have all the other options. tablet and phone users — single click on the passage you want to comment on, then click on the resulting at the far right margin. Note: the bigger your screen size the better! Click on the “Reply” button at the bottom left corner of a comment and a window similar to the one above will pop up. After you finish writing and submitting your comment it will appear slightly below and indented to the right of the comment you replied to. Once the commenting window is open, specify whether your comment is about a Sentence, a Paragraph (includes images and video/audio players), or the Document in general. The pop-windows offer two Advanced Options, “Private Reply” and “Tags” (available by clicking the arrow next to “Advanced Options”). We describe these on our Features Gallery page. When you finish writing and proofing your comment, click the blue button at the bottom right of the pop-up to submit it. There can be a time lag of several seconds, but only click the button once! By default, a document uploaded to NowComment is private; no person or Group you don&apos;t invite to it can see it. Public Documents, described on our Features Gallery page, can be found and seen by others through search engines and by browsing our Public Documents page without an invitation (but sending invitations to a Public Document is a good way to get people to it!). Anyone can invite people and NowComment Groups to a Public Document, but only the Document Owner can invite others to a Private Document. invite people you&apos;ve previously shared documents with, people who have shared documents with you, and Groups you already belong to (all will be in your Address Book). If you want to create a new Group create it from your My Library page first. invite new people; just input the email addresses, separated by commas, of everyone you want to invite. Each of the above has its own tab. For more information see our Sharing (Inviting) page. Click to print your document in Combined View (described below). Mousing over the icon provides basic information about the document (e.g. who uploaded it, when it was uploaded). Our highlighting tool gives you 5 public and 5 private highlighting colors; each can have a customizable meaning. This very powerful NowComment feature is described in its own Highlighting help file. File Download, File Copy, Tag, Reports, access to Document Properties, and other features are available off this menu; explore at your leisure! 2-Pane View is the default already described; it&apos;s best for reading the document with minimal distraction and reading selected comments. Combined View puts the document and the comments together in a single pane, making it easy to scroll through the document and read all the comments without needing to do any clicking (but distracting when you&apos;re trying to read the document itself). General Document comments at the very bottom. You can click on the link in the top header, or just scroll down, to reach them. This feature (if turned on) will send you an email notification of each comment made on that document (either right away or as part of your Daily Digest email, depending on what you chose in your Comment Notifications. If shown, the Document Owner has set Time Controls (via Document Properties) that don&apos;t allow new comments on the document at this time. Public Documents have clickable icon links that let you post about those documents for Facebook, Twitter, and (via the “AddThis&rldquo; plug-in) other social media services. These social media links aren&apos;t given for Private Documents since they&apos;re supposed to be private! Note: if you&apos;re running a web privacy tool it may block these; if so, you&apos;ll need to customize it to allow (“whitelist”) nowcomment.com . That covers the basics of using NowComment; it&apos;s easy! More information on each of these and other topics is available on our Help pages. 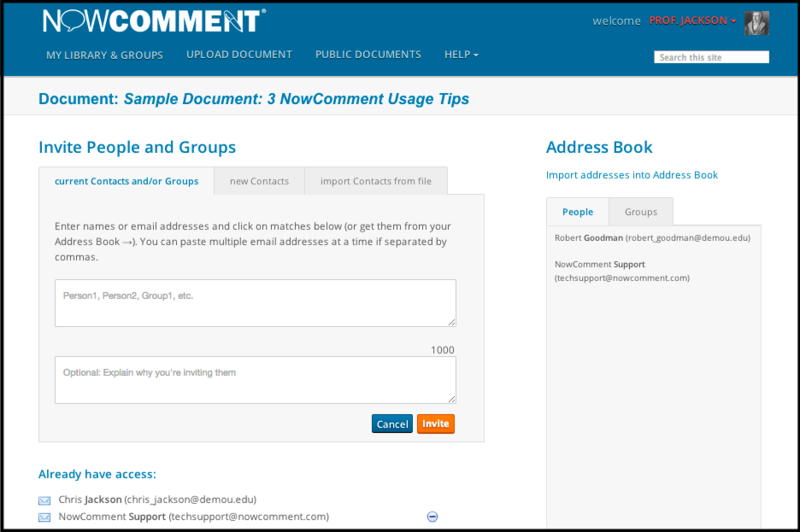 You can try NowComment by commenting on a Public Document or by uploading your own document.